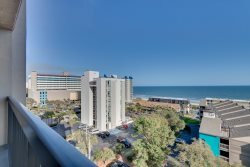 One bedroom oceanfront 5th floor efficiency condo offers a private and perfect for a couple's vacation get-a-way. One bedroom oceanfront 5th floor efficiency condo offers a private and perfect for a couple's vacation get-a-way. This gorgeous condo has everything you need for a quick get-a-way! This is the policy of Sand Dunes Resort, and we apologize that they will not allow private owners and guests to access this feature.